Located within sight of the Shock Hill gondola station near the Cucumber Gulch Wildlife Reserve, Cucumber Patch homes for sale are a small cluster of duplexes that share a large, common yard. In the exclusive neighborhood of Shock Hill, they offer the privacy of home ownership, and the benefits of a condo: communal maintenance and property management. Cucumber Patch subdivision was designed to compliment the culture of custom homes in the Shock Hill neighborhood, yet offer a more affordable alternative: a low-density, clustered development. They are just twelve units in total, six buildings of two homes each. Each one has large decks, tall ceilings, a two-car garage, and an open floor plan. Browse the most up-to-date Cucumber Patch real estate listings for this exclusive area now, or learn more about living in Breckenridge, CO.
Nordic ski trails circle the property, and Cucumber Gulch Wildlife Preserve verge on the subdivision. Trails connect Cucumber Patch real estate to the Breckenridge Ski Resort and downtown Breckenridge, and so does the gondola. Ski, hike, bike or enjoy the wild flora and fauna from any home for sale in Cucumber Patch, and easily walk or ride skiing or town. Being located on Shock Hill has many advantages for owners of Cucumber Patch real estate. 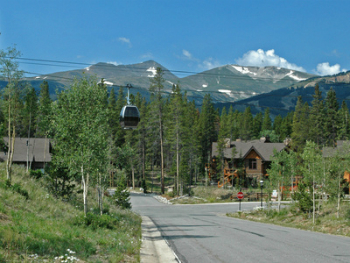 The scenic overlook opposite the Shock Hill entrance exemplifies the vantage point this neighborhood offers onto all of Breckenridge below. But nothing is far, and if you walk down any of the trails or sidewalk, you'll find whatever you need in town in minutes. Back on top of Shock Hill, where Cucumber Patch homes are located, the land levels out for a bit, and Cucumber Creek slows down enough to make wetland habitat for birds, moose and other wildlife. Not far to the west, the terrain angles up again, until it forms the ridgeline of the Tenmile Range. Size (sq. ft. liv. area): 2284 sq. ft. to 2618 sq. ft. Amenities: In town, very short walk to gondola and bus, Nordic Ski in/out, crosscountry trails, hiking or pedestrian trails, paved roads, forested, nearby wildlife preserve, views of Baldy and town. Take Ski Hill Road heading west for about one-half mile, turn right into Shock Hill and pass under the subdivision sign and bridge. Take the first left onto Cucumber Patch Place. Need to talk to an expert? The professionals at Breckenridge Associates are waiting to answer all of your questions about Cucumber Patch or other Breckenridge real estate opportunities. Contact us now.